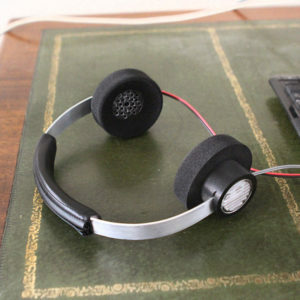 This page covers the basic information you need to design each style of headphone. There are almost no publicly available resources on headphone design, so I’ve learned pretty much everything here through my own testing. If you have some knowledge to add, please email me. I would really appreciate it! Getting a great sounding closed back design was not straight forward and took a fair amount of testing. If you are interested in how I arrived at the conclusions below, the details are outlined here. 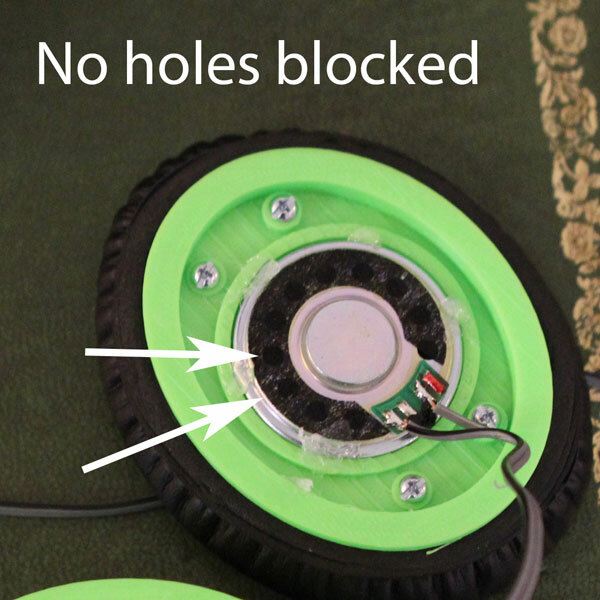 The rear of the driver will have a series of holes to reduce the pressure buildup behind the driver’s diaphragm. These holes will in turn be covered by a cloth. Headphone manufacturers ‘tune’ their drivers by varying the density of this cloth. You can actually see the differences between different manufacturers’ drivers by holding them up the the light, for example there was a very noticeable difference between the Dayton CE38MB-32 and driver from my Philips SHL4500WT’s. As we can’t change the density of the cloth, we can instead tune the driver by blocking some of the holes. Doing this is one of the most effective ways of ‘tuning’ the sound of your closed back headphones. It will reduce the bass and mid frequencies, making the treble more prominent, ie flattening a frequency response curve that is biased towards bass/mids. Reducing bass/mids may sound insane, but the reality is quite the opposite with some drivers, eg Dayton Audio CE38MB-32. 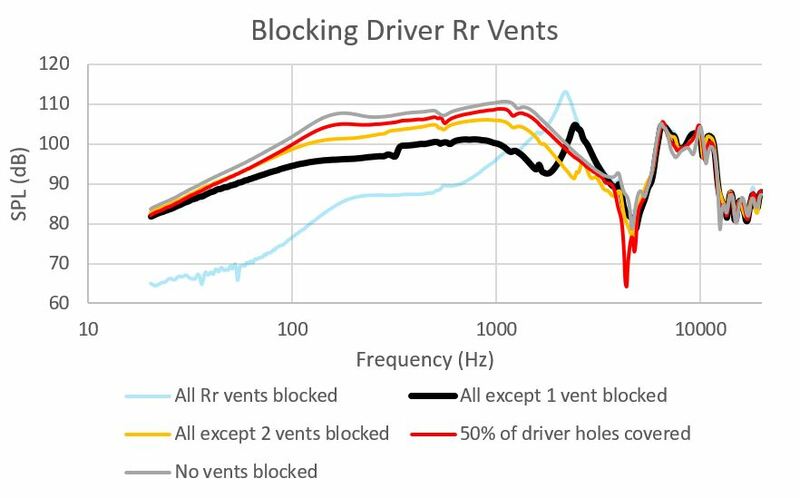 Installed with no blocking of its rear holes, this driver lacks ‘brightness’ of sound, and this can be seen in the lack of treble in the frequency response curve below. Thus, blocking its rear holes flattens the overall frequency response curve, giving a much nicer sound. The black line below shows what I believe to be close to the optimal ‘tuning’ of the Dayton CE38MB-32 in a closed back design: all except one hole blocked. 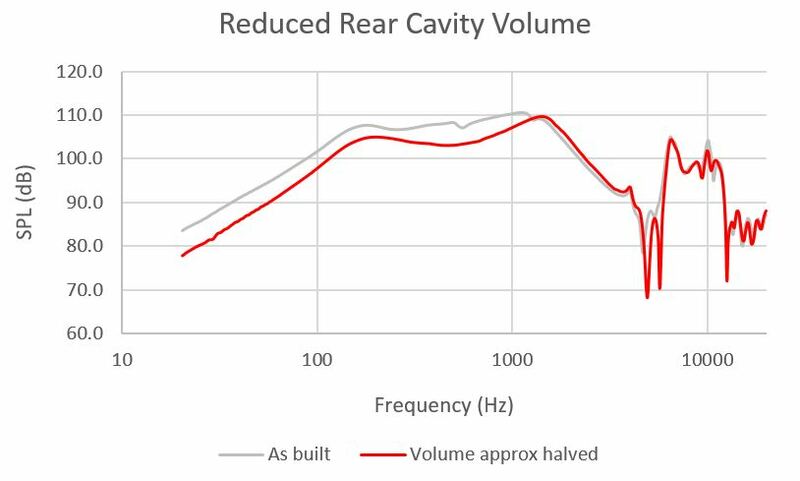 Note that with all except 1 hole blocked, the frequency response curve is less steep at the low frequencies. Thus as you raise the volume to compensate for less low/mid frequencies, you may actually perceive there to be more bass – imagine the black line if it was transposed upwards. In summary, if your build lacks ‘brightness’ of sound, try blocking the rear driver vents. 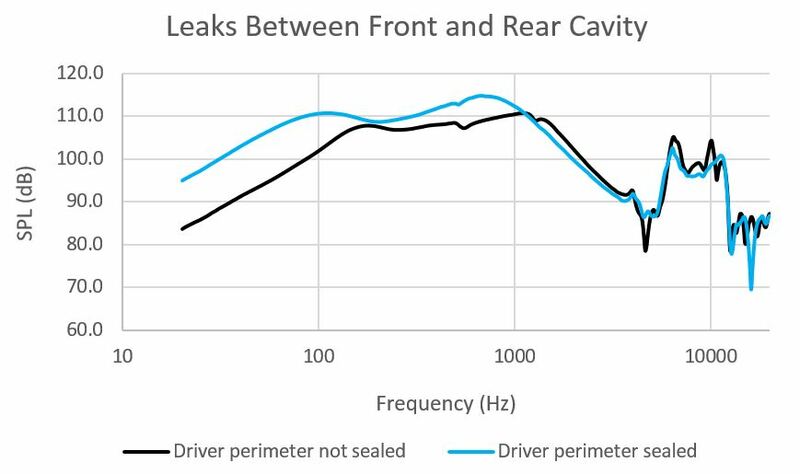 Whether or not the cavity behind the driver is sealed or vented to the air around the headphone has an impact on the sound – in general venting adds bass. The chart below shows the effect of venting. 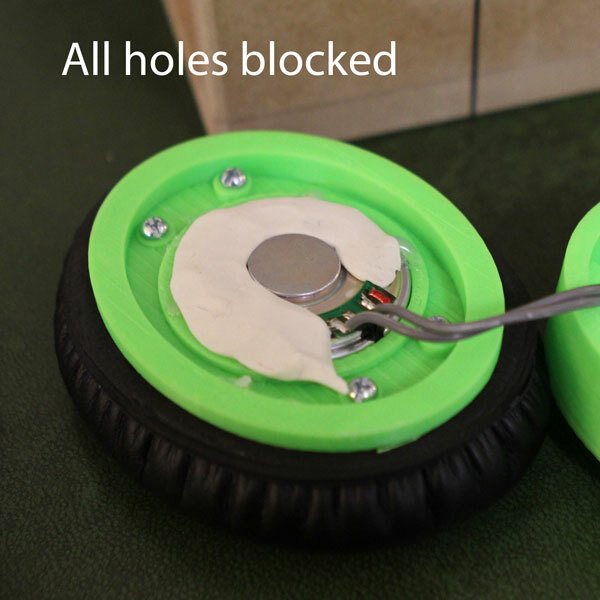 The headphone ‘as built’ was fairly tightly built, but defiantly had some leaks. The blue line shows it completely sealed with plasticine. 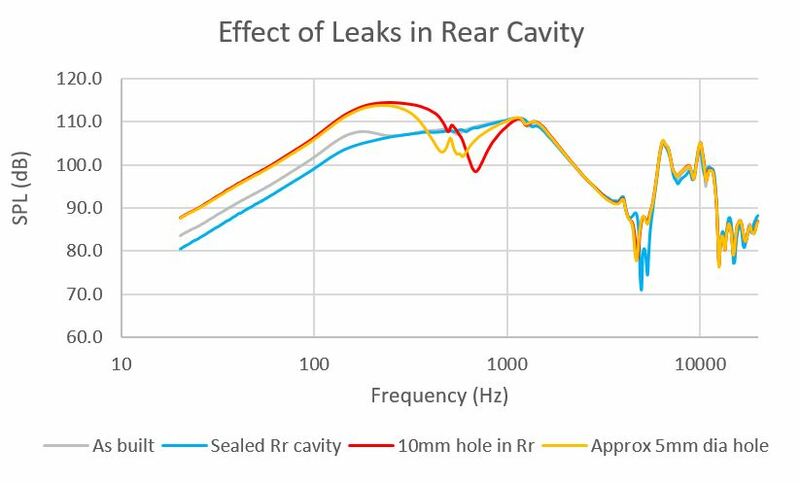 Given that we desire a flat frequency response curve, I wouldn’t recommend adding vents, nor trying to seal the rear cavity – just build the headphones to fit together nicely. If you want to go all out in the pursuit of sound quality, you could seal it, then drill progressively larger holes until you get what you think sounds best. Reducing the rear cavity volume reduces bass. It’s that simple! The effect does not appear huge though, in the test below I roughly halved the volume. 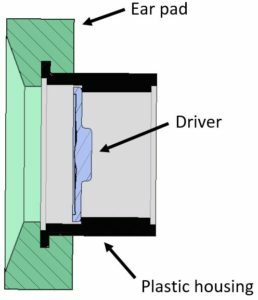 If there is a leak between the front and rear cavity, such as poor sealing around the perimeter of the driver mounting, you’ll loose some low/mid frequencies. As my baffle was 3D printed and hence a bit rough, there was some leakage around it when it was spot glued in (black line below). When the perimeter was sealed, there was significantly more bass and some more mids. I don’t consider sealing of the ear cavity (ie area in which the ear sits, surrounded by the cushion) a design variable, but more a problem that can occur, particularly if the headband is not correctly adjusted. Basically, the interface between the ear cushion and face/ear and also between the cushion and headphone itself should be sealed. One way that this seal can be degraded is hair running under the ear cushion. Unless you want a haircut, not too much can be done about that though. Another cause is the cushion not sitting ‘flat’ around the ear. 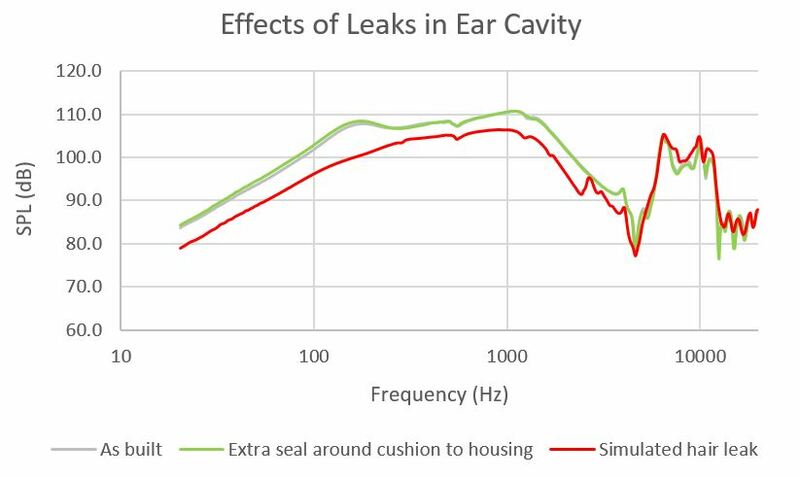 The hair leak was simulated by putting a pencil under the cushion. This is probably more extreme than most hair leaks, but shows the effect nevertheless. I sealed the cushion to headphone housing interface in one test (green line) as I wasn’t 100% sure this was sealed properly. It looks like it was! I have noticed that on some commercial designs the driver is angled approx 5° rearwards, ie ‘into the ear’. I tried to test this, but without a replica of a human ear on my rig, I couldn’t measure the effects of varying this angle. Below is the second iteration of my closed back design, which incorporates the above findings. They have all except one hole on the rear of the driver blocked. 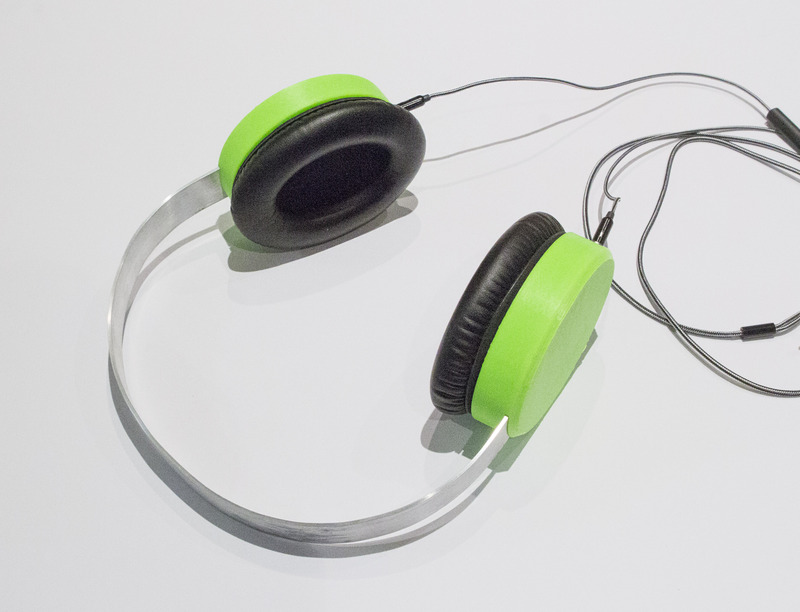 The sound is amazing – they are bright and have decent bass plus awesome clarity. Add a couple of plates on the ends to protect the driver. The outer one could be something cool like stainless steel mesh. The main thing is that they have plenty of openings to allow the sound through. I used Dayton Audio CE38MB-32 drivers and Grado replica foam cushions off Ebay. Both worked excellently. The frequency response is not as flat as the Grado’s, but they did only cost me about a tenth of the price! The gimbal is the part of the headphone that rotates in two directions to align with your ear. Some headphones use different configurations, but the most common is a fork which allows rotation about it’s 3 connecting points – 2 to the can and one to the headband. The gimbal is probably the most difficult part of Homebrew Headphoning, so I’ve tried to simplify things as much as possible. This is the easiest way to implement a headband and looks pretty good. I used this before designing 3D printed headband and works reasonably well, although is a little stiff. By designing the slot in the headphone cover to approx 2.1mm thick, when 3D printed allows the band to slide in and out with a good amount of resistance. The cheapest way to do the wiring is using hookup wire into a 3.5mm headphone jack, but this looks pretty mediocre. Instead I have used replacement cables for Sol Republic Master Tracks HD V8 V10 V12 X3 off Ebay. They are pretty expensive for what they are at about $18, but offer an easy to implement, professional looking cable and can be bought with a microphone and volume control. Incorporate a 2.5mm jack into your headphones. This is pretty easy to do and allows you to replace the cable if they break. Remove the 2.5mm plug and solder the cables directly to the driver. To do this, cut the plugs off, split the rubber sheath and expose the ends of the twisted wires. The wire will be coated with an insulator. To remove this hold the ends of the wire under a flame for a few seconds, then you are ready to solder it onto the drivers. See the Where To Get Parts page for details on the wiring I have used. In due course I plan on sourcing cables to my design out of China and selling them via Amazon and Ebay at a lower price than the Sol Republic ones. Here are some general bits of advice, most learned the hard way! Mount the drivers from the rear: the mylar film on the front of the drivers it very delicate and easy to damage, so if you have to push the driver in from the front you are almost guaranteed to damage it. If you are designing a pair from scratch, test the dimensions of any part interfaces before finalising and printing your complete design. For example if you are creating holes for a 2.5mm jack, print a cube with the hole to tune the fit between the jack and housing. My experience with 3D printing is that it is not too accurate and takes a fair bit of tuning to get tightly mating parts fitting together properly. This will minimise wasted time and filament.